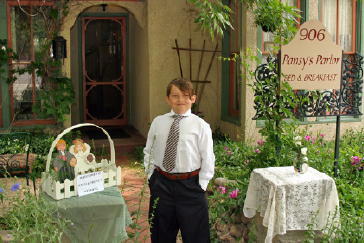 There’s almost a storybook quality about our historic B&B, that you sense, when you first step through the front door. It’s as if you’ve stepped back in time, just the two of you, for your perfect, romantic get-away. Each season offers its own rewards at Pansy’s Parlor. Relax on the secluded backyard patio or deck, whether you’re smelling the roses, or watching the autumn leaves fall. Warm yourself in front of the one-of-a-kind fireplace, before retiring to your charming, antique-filled room. Stroll through the summer perennial garden, on your way to the old fashioned porch swing under the arbor. Cool off in the privacy and air-conditioned comfort of your room, as you watch a movie from our collection, or yours. REMEMBER…You can walk to all of Golden’s downtown attractions from our front door! Pansy’s Parlor hosts on-site weddings, receptions, rehearsal dinners, anniversary, birthday, and private celebrations, bridal and baby showers, office parties, professional meetings and retreats. 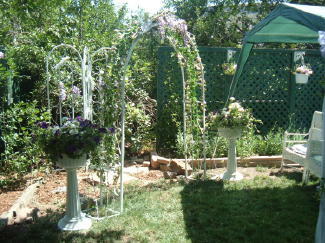 Intimate parlor, (indoors), or seasonal garden weddings, (outdoor), or a combination of both areas, are sure to create a special, memory-making event, when held at our lovely, 1879 Victorian B&B. 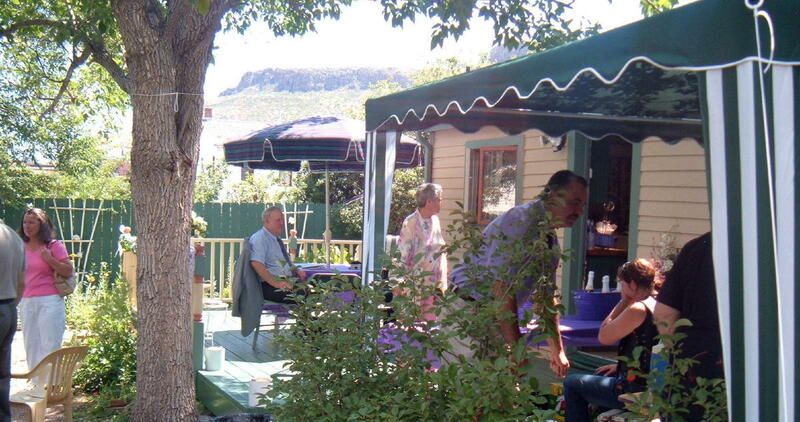 Garden weddings or other functions, can feature open-air, or covered, (awnings) seating. We can provide all tables, (banquet or round), chairs, linens, service-ware, (including plates), and flower containers, (glass, wicker, ceramic). Our antique, iron Victorian arch, laced with vines and flowers, makes an unforgettable impression, as it frames the bride and groom! We can set up, and provide all the needed audio equipment, microphones, amplifiers, etc for your special event. Let us put together a HONEYMOON PACKAGE, or host your guests’ overnight stay. Discounts are available for multi-use of the Parlor! Let us put together a few little “extras” to add to your Great Get-away experience. 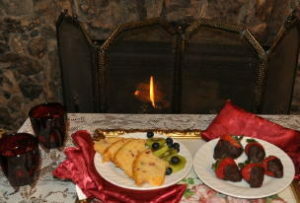 Birthday, Anniversary, “Sweetheart Special,” Theatre, Spa, “Pansy’s Picnic,” and “Candlelight Dinner,” Packages are all available at very reasonable rates.